Every opportunity is different. Re-order items and groups, change group names and create new ones, and change quantities and prices inline. Any changes you make to the items list are reflected on your document layouts, so you can put together documents that really appeal to your customer. We’ll run through some of the ways you can customize your items list and how those changes are displayed on your documents in this guide. By default, products added to an opportunity are automatically grouped under their product group heading and services are grouped together under their service type. Grab the handle (the three bars) to the left of the product or group to move items around the list. Create sub-groups by dragging and dropping groups into other groups. Use the add a new item/group link at the bottom-right of the items list and choose group to add a new group to the opportunity. To change a group name, just click on it and type in your new name. Sometimes it's good to add a few words to provide a bit more detail about a product, service, or group. To add a description, click the blue menu at the end of a line in the opportunity items list and choose Edit from the menu. Add a description to the description field. Product and service descriptions appear in the items list underneath the item. Customer called to change numbers? 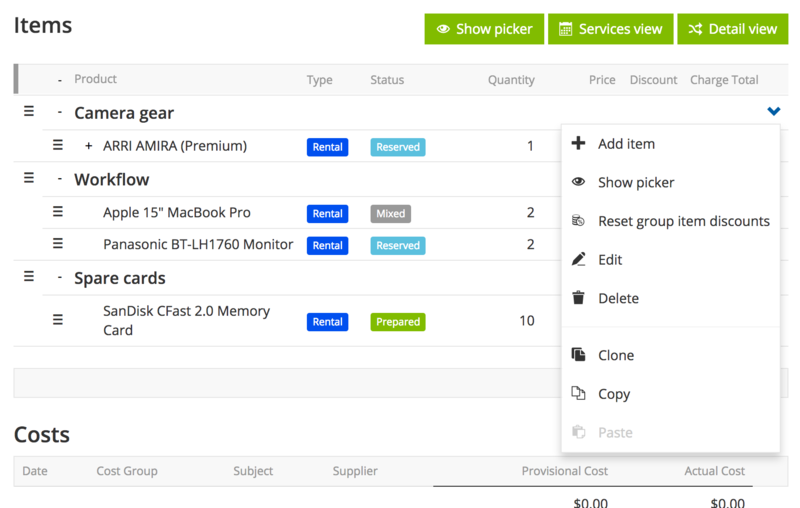 Adjust chargeable days, quantity, price, and discount for your products and services by clicking on the field in the items list and entering a new value. Changes to the charge total are calculated immediately and your availability is updated. Accessories are set up against products in Resources > Products, but you can add “one off” accessories to items on your opportunity. This will not be configured in Resources against your product, it will only persist for this opportunity. To add an ad-hoc accessory, click the blue arrow to the right of a line and choose show picker or add item from the menu. 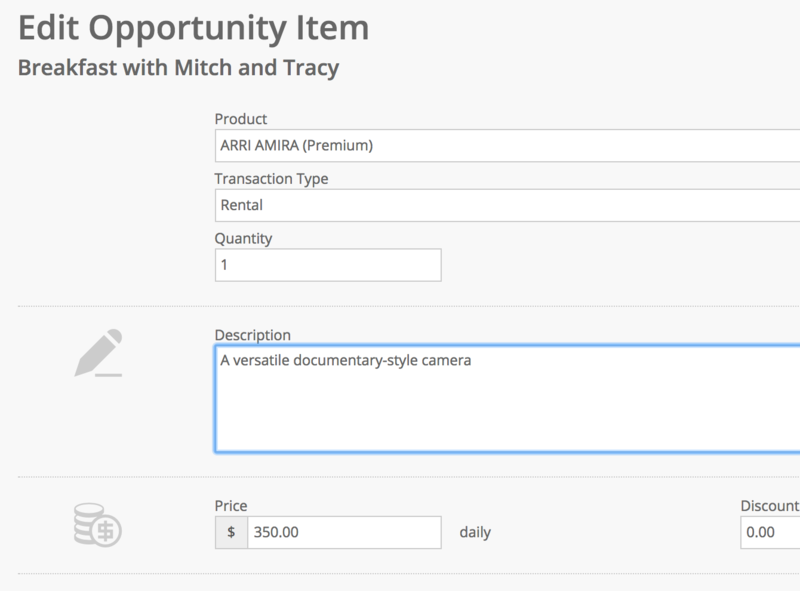 Use the product picker and add new opportunity item screen to add items as normal. They'll be nested underneath the item. To create a copy of a group on an opportunity, click the blue arrow next to the group and choose Clone from the menu. To create a copy of a group on a different opportunity, click the blue arrow next to the group and choose Copy from the menu. Then, fire up a new tab and find the opportunity where you’d like to paste the new group. Choose add new opportunity item/group and then paste from the menu. Changes you make to the items list are reflected on the document layouts generated by your system. Current comes with a variety of layouts to choose from, including seven quotation layouts. Each of the layouts displays information slightly differently, meaning that you can create something that's really bespoke. Why can't I change something? Pricing is locked on the opportunity. When pricing is locked, you can't make changes to things like the quantity, price, or discount of an item. Unlock pricing to make changes. Your account doesn't have permission to make changes. Your account administrator might have set up a role on your Current RMS to prevent your account from making changes to an opportunity.